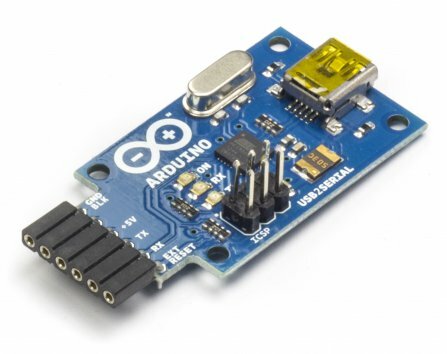 This board converts a USB connection into 5 volt TX and RX that you can connect straight to the Arduino Ethernet or any other boards with an FTDI cable-compatible connector. It features the Atmega8U2 programmed as a USB-to-serial converter, the same chip found on the Arduino Uno. The USB Serial module has an ISCP interface, allowing you to reprogram the chip when placed in DFU mode. The pin outs on the connector are compatible with a standard FTDI header (as well as the Adafruit and Sparkfun USB-Serial adapters).